Most energy industry watchers saw the growth of energy storage to be inevitable in order to support renewable energy growth and to stabilize the grid, but deployment had been slow until now. Several new projects coming online during the first quarter 2017 made it the first significant deployment of energy storage in the US to date: 234 megawatt-hours of energy storage. That’s based on GTM Research’s first quarter report. The “Aliso Canyon deployments” that Manghani is referring to include Tesla’s biggest Powerpack project yet, a 80 MWh Powerpack station with Southern California Edison – pictured above. Though that project wasn’t deployed, or at least not entirely, during the first quarter, though it looks like GTM is counting it. Tesla reported the deployment earlier and only had a total deployment of 60 MWh in Q1. Most of Tesla’s contribution to the record quarter for energy deployment was the 52 kWh Kauai project in Hawaii – giving the company a ~22% market share. 71 megawatts of energy storage were deployed in Q1 2017, growing 276% over Q1 2016. 233.7 megawatt-hours of energy storage were deployed in Q1 2017, an increase of 944% from the same quarter last year. Front-of-the-meter deployments grew 591% from Q1 2016 in MWs, boosted by a few large projects in Arizona, California and Hawaii. Behind-the-meter deployments dropped 32% year-over-year in MWs, much of which can be attributed to declines in California’s behind-the-meter market as players awaited the opening of the new Self-Generation Incentive Program regime. 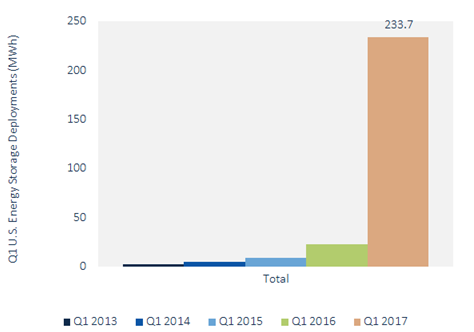 GTM Research expects the U.S. energy storage market to grow to roughly 2.6 GW in 2022, almost 12 times the size of the 2016 market. By 2022, the U.S. energy storage market is expected to be worth $3.2 billion, a tenfold increase from 2016 and a fivefold increase from this year. Cumulative 2017-2022 storage market revenues will be $11 billion. The research group explained that 91 percent of all deployments can be attributed to front-of-meter energy storage. Therefore, there’s room to grow the behind-the-meter market and Tesla could help there during the second half of the year. What we are seeing for the first quarter could be only the beginning of something even more impressive during the second half of the year if the growth of behind-the-meter storage could catch up with the growth of front-of-meter energy storage. While front-of-meter’s total capacity will undoubtedly remain larger, Tesla’s Powerwalls at 14 kWh each, and its competitors, can also add up if they are mass-produced.